Driven HDF Fork & Shock Fluid UNIVERSAL - Brakeswap.com - Friction for the Win! 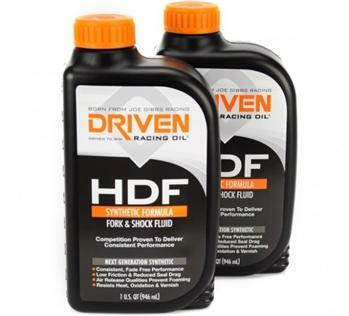 HDF Fork & Shock Fluid by Driven Racing Oil™ exceeds the performance requirements for all brands of motorcycle fork fluid, and it is also the proper viscosity for Koni, PRO and all twin-tube racing shocks. This new fluid utilizes next-generation synthetic oil technology to provide consistent, zero-shear, fade-free hydraulic damper performance. The low-friction formulation has been proven in competition. It utilizes a high-viscosity-index base oil and a proprietary additive package that reduces seal drag, improves air release to stop foaming during fluid handling and maintains its viscosity under extreme heat and high loads. It is designed to resist heat, oxidation and varnish. Driven Racing Oil™ Synthetic HDF Fork & Shock Fluid outperforms conventional oils and delivers outstanding performance in extreme powersports and racing applications.